Optical power 30Mw(Transmission distance 20-30 km). Easy identification of fiber break,bend, you can protect the fiber layer. To-end fiber identification. FP-LD laser. Universal connector fit Interface FC ST SD. Visual Fault Locator. Uncertainty(dB): 0.2(5%). 1 x 10 mv Visual Fault Locator. 1 x Cotton bag of Visual Fault Locator. Optical connector: 2.5mm universal connector. Date Storage Capacity: 1000. Wave ID nm: 850/980/1300/1310/1550/1625. Compact, lightweight, universal optic interface design,easy to carry and operate. 1 Network Cable Tester. Ergonomic design, easy and fast for user to use with simple key operation mode and comfortable hand feeling. (Fiber Optic Lab Testing. Comfortable LCD display and optional backlight LCD display supports night operation. excluded.). The WF3306B optical fiber identifier also recognize the modulation like,270Hz,1kHz and 2kHz. -Efficient fiber identifier. 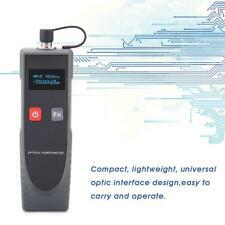 RY-3306ID Optical Fiber Identifier. Optical Fiber Identifierquickly identify the direction of transmitted fiber and display the relative core power. Manufacturer: EXFO. 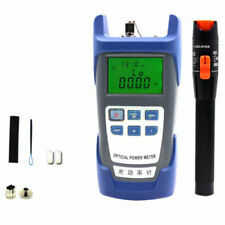 Product Optical Loss Test Set. Condition: NEW. 1 Piece Visual Fault Locator. - Wavelength Spectrum (nm): 860nm to 1626nm. JDSU MP 60 OPTICAL POWER. Display Range(dBm): ≤10. Working Wavelength(nm): 800~1650. Uncertainty: -70~ 10@1550nm. Assembled with 2.5mm universal connector suitable for all φ2.5mm optical connector. (support FC/SC/ST connectors). This item works great and in great condition. 1 Piece Visual Fault Locator. - Wavelength Spectrum (nm): 860nm to 1626nm. People always bought together with. 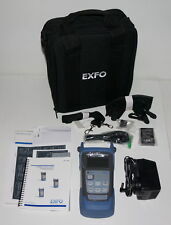 EXFO Fiberoptic Tester. Conditions : Used. In good working condition. ITEM SPECIFICATION. EXFO Fiberoptic Tester. Conditions : Used. In good working condition. 1 Piece Visual Fault Locator. - Wavelength Spectrum (nm): 860nm to 1626nm. 1 Piece SC Connector. Detector type: InGaAs. Uncertainty (dB): 0.2(5%). Date Storage Capacity: 1000. Power Adapter(V): 8.4. Wave ID nm: 850/1300/1310/1550/1490/1625. Display resolution(dB): 0.035. Operation Temperature(oC): -10(oC) 60. Detector type: InGaAs. Connector: FC(2.5mm). Wave ID nm: 850, 980, 1300, 1310, 1490, 1550,1625. Display Resolution: Linear Display 0.1%; Logarithmic display 0.01dBm. Operation Temperature(oC): -10(oC) 50. 1x FC adaptor (installed on the host). 1x SC adaptor. Display Resolution: Linear Display 0.1%; Logarithmic display 0.01dBm. Size(mm): 180x83x28. Working Temp(℃): -10~ 60℃. Standard Wavelength(nn): 850/980/1300/1310/1490/1550/1625. Results can be downloaded to a PC for further analysis. PON (1310nm, 1490 nm and 1550 nm). Simultaneously verifi es the power levels of all wavelengths of PON (1310nm, 1490 nm and 1550 nm). Dust and shock proof design. Available Wavelength: 800~1700nm. Standard Wavelength: 850/ 1300/ 1310/ 1490/ 1550/ 1625nm. 2.5mm universal optical interface (FC, SC, ST are supported). Optical Connector: Interchangeable FC, SC, ST with built-in universal 2.5mm adapter. 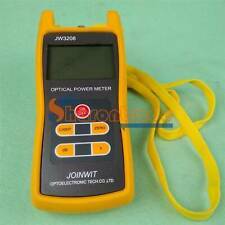 1310&1550nm Singlemode Optical Laser Source Komshine KLS-25M-S Handheld Fiber Optic Light Source. Wavelength 1310/1550. High stabilization, build in optic isolator. Wavelength 850/1300/1310/1490/1550/1625 nm. Conditions : Used. In good working condition. Fiber Optic Products. Fiber Optic Tool Kit. Fiber Optic Cleaner. Table Runner. Fiber Converter. Fiber Cleaver. Fiber Cable Stripper & Crimper. Fiber Cutter Pen. 1 x 30Mw Cable Tester (not include battery). It is a compact device with backlight swich and auto power on-off ability. The 650nm Pen-type Visual Fault Finder is specially designed for field personnel who need an efficient and economical tool for fiber tracing, fiber routing and continuity cheching in an optical network during and after installation. Output power: 10mW. Uncertainty (dB). Test for both single-mode and multi-mode cables with optional 2.5mm fiber optic(Standard) connectors to 1.25mm adapter(Optional). 1 x Visual Fault Locator. Our Optical Fiber Cable products covers, Indoor Optical Fiber Cable, Outdoor Optical Fiber Cable, FTTx Optical Fiber Cable, Armored Optical Fiber Cable and Optical fiber Cables for Datacenter and Base station. Universal push pull interface (2.5 or 1.25 mm). Conditions : Used. In good working condition. Twintest and Auto-λ.